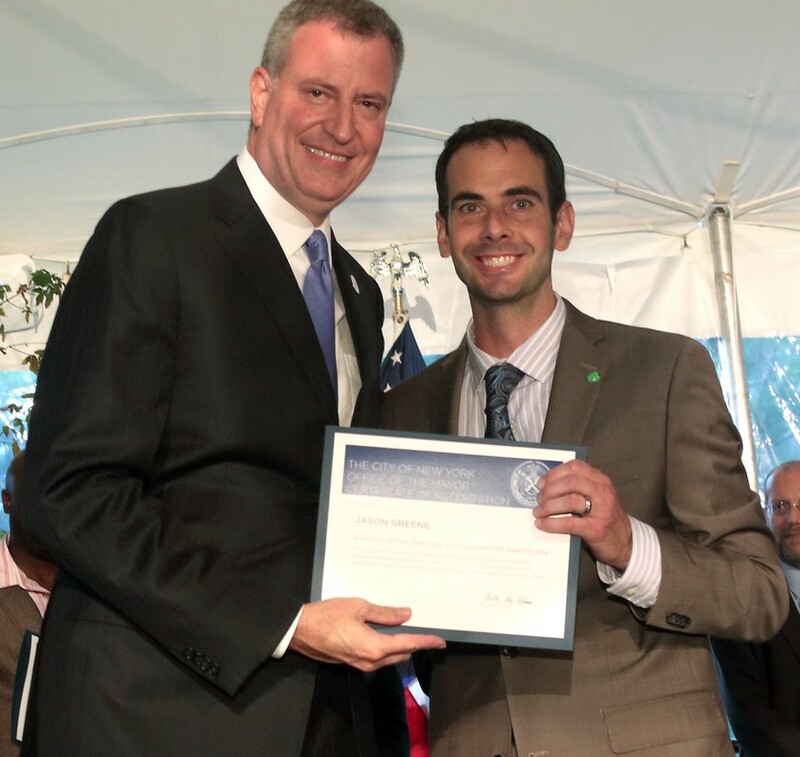 “Jason Greene,” came through the speakers and I walked up the stairs to shake Mayor de Blasio’s hand and receive a Dads Matter award; an award given to ten dads that have overcome adversity to become a good father at home and in the community. My hands clutched the steering wheel tightly as I drove away from picking up our vegetable share from our local CSA. I was upset that my wife had asked me to pick up the vegetables because: 1) I was in a time crunch, 2) I didn’t want the vegetable share to begin with, and 3) it meant that I had to drive into Manhattan to pick up my award. And I hate driving in Manhattan. But there I was, driving away with my kids in the back seat and the aroma of dirty beets, carrots, strawberries, and lettuce filling the car. I should also mention that I have a terrible sense of direction. I should also mention that my phone was dead because my daughter unplugged it so she could charge her iPod and take pictures at the ceremony. And so the stage was set for my perfect storm of emotions: I had a dead phone, a terrible sense of direction, I was picking up vegetables that I didn’t want, and I was about to meet the mayor and receive an award. And I missed my exit. My kids and I sat silently in our car just like my car sat unmoving in the middle of the road. Traffic was backed up for miles and I was ready to spontaneously combust. My anger issues that I constantly try to bury welled up inside my chest. My heart beat fast as rage rolled around in my brain. The muscles in my shoulders bounced and tightened. I didn’t want to be in the car. I had wanted to take the Subway. I didn’t want the vegetables that sat next to me. Time was ticking away… and we sat still. I felt like jumping out of the car like Michael Douglass and erupt in a loud yell. Then, my kids began to argue and shove each other in the back seat. And I lost it. I yelled loudly and angrily. I didn’t call them names, nor did I make it personal. But I yelled at them for fighting with one another. I yelled at them for my dead phone battery. I yelled at them for not being ready when I wanted to leave. I was a volcano. The anger that I had towards my wife boiled over as well, as I vented that I didn’t want to drive. I have given my life for my family and finally something was happening for me and I was about to miss it. Traffic began to move as the car returned to silence. I pulled off at the next exit in hopes that I could turn around. But I couldn’t. So I traveled underneath the expressway hoping to catch up. But there was nothing. I pulled the car over and asked a mechanic for directions, and after a couple of mechanics and an interpreter, I was on my way and headed in the right direction. “Sorry daddy,” my oldest son said. “I’m sorry that you’re going to miss your award.” I already felt guilty for my eruption and his sweet words floored me. Tears welled up in my eyes as I apologized to my kids. I told them I loved them and that they were more important than any award. I had already won “World’s Greatest Dad” 9 years in a row. We pulled up to Gracie Mansion (the Mayor’s home), and the kids and I walked along the path. As I gave my name to the keepers of the list, I was greeted and adorned with praises about my good parenting. Inside, I felt like a heel. Like I was an abusive parent. We walked towards the back yard and got some drinks and I knelt beside them and hugged them. When my wife arrived, my kids told her that I was mad and almost cried. Which made me feel even more disgraced. I had let my family down. I was led with the other honorees to the back of the house where we met the Mayor and his wife. The sting of my behavior still haunted me. Mayor de Blasio spoke briefly and congratulated all of us, we took a group picture, and then we all walked towards the stage. As I waited for my name to be called, I wondered what my children were thinking. Were they thinking that their father was a hypocrite or had they already forgotten? I felt like declining the award. Then, my name was called and the mayor of NYC gave me a huge hug. He handed me the award as he towered over me and posed for a picture. More names were called and photographers and those in attendance applauded and took pictures. I found my daughter’s eyes in the crowd and we smiled at each other… and then she winked at me. When I tucked my kids into bed that night, I apologized again for my behavior in the car. I told them that everything was my fault. My phone was dead because I let it die out and didn’t charge it earlier. It was my fault that I missed the exit. And although they shouldn’t fight in the car, or anywhere for that matter, it wasn’t their fault that I lost my temper. I wanted them to know that it isn’t okay to lose one’s temper and that I shouldn’t have done so. We hugged and I told them how much I love them. And off they drifted to sleep without a care in the world. Parenting is difficult. Being a dad with anger issues makes it even harder. Uncontrollable anger has been passed down from one generation to the next in my family for far too long. I want it to end with me. Hopefully when my children grow up and encounter similar circumstances, they will tackle the situation with ease and sensibility. And maybe my own imperfections will make the lesson of grace even more real to them. Did I deserve that award? I still don’t think so. I’m sure there are more deserving men in NYC. But I do cherish the fact that my children consider me the “World’s Greatest Dad.” I fail from time to time, but my kids go to bed every night knowing that I love them unconditionally and that I’ll try to be a better dad the next day. And maybe that’s all any of us can do. You are every thing I was not. I am thankful to see the cycle of violence stops with you. My Grand Children are lucky to have you as their Dad. The future looks bleak sometimes for this nation and our planet but I believe you have passed on to them the emotional stability that will help them meet the challenges a head. In other words good job to you and Cara. Previous Entry What is a Modern Dad?